UK Roofing Limited have a team of highly skilled professionals that specialise in supplying, installing and repairing fibre glass roofs across London, Guildford and Surrey. 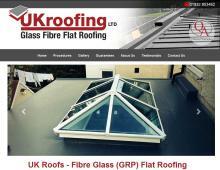 UK Roofing Ltd specialise in new fibre glass roofing installations and flat roof repairs. GRP (Glass Reinforced Polyester) roofs are a popular choice for domestic and commercial roof installations. The range of grp roofs from UK Roofing Limited come with a 30-year company quality guarantee and a 10-year insurance backed guarantee. The insurance is provided through reputable underwriters that UK Roofing Limited have been working with for many years. If you are looking for a flat roofing company in London, Guildford or Surrey to install or repair flat roof areas of your property, contact UK Roofing Limited for a survey and free no obligation quote.